Is there a way to clarify the true and false statements in this JS? How do I remove points that have passed on a segment in opeenlayers 3? How to find if point belongs to polygon by forming triangles? I am complete Newbie on programming with R, especially with the library spatstat. And so i hope that anyone can help me. I want to simulate a Boolean Model. In my case, this is a Poisson-Pointprocess with closed circles with radius r around the points of the point process. With X = rpoispp (100) I can already simulate the point process. 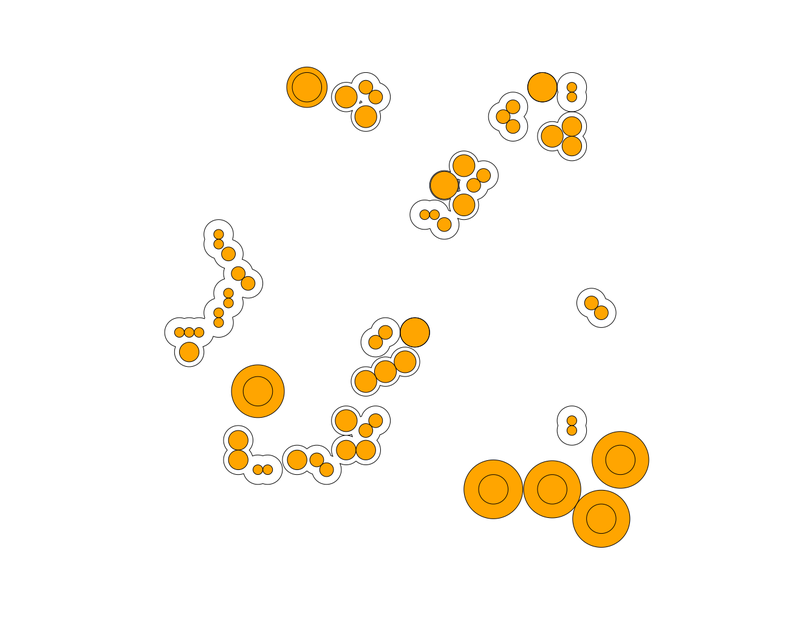 But I have no idea how to generate the circles around the dots. my google research was unfortunately not successful. Above X is a polygonal approximation of the union of discs. Alternatively the Boolean model is often represented simply as a marked point pattern with the disc radius as the mark. What is more convenient depends on the context. Actually this command is not the entry point of container and I run it inside another shell but inside a long running container (testing container). I think this problem refers to using () the subshell concept inside sh. It seems it does not let output go anywhere when ran in background. sh -c "cd inse/; sh start.sh > log.txt 2>&1 &"
I'm extending Remote Control using the plugin Extend LimeSurvey. , this returns 0. What I can't understand is that I can instantiate Participant, only cannot retrieve any Participant information. I'm not used to Yii framework. Am I missing something? I've been working on learning JS, and I can't seem to figure out why my boolean values keep coming back either always true or always false. So I believe I understand the basics of the truthy/falsy situation in JS, but I can't seem to get it right. I know that there are data type issues, (can't make different data types do different things). Define a function lastCharacter that accepts two strings as arguments. lastCharacter should return true if both strings end with the same character. Otherwise, lastCharacter should return false. They either return always true or always false. Can anyone help me? I expected the output to be 3.
but I got None. why? I know it doesn't work, I'm new to Haskell so i keep encountering errors i don't understand. How can i make it ? Numbers are not limited to one digit, r, g and b range from 0 to 255. I have a convex polygon and some points. I have to form a line between 2 points and then form a triangle with another point. The point from inside the triangle are inside the polygon too. The algorithm continues by forming triangles until finding all the points belonging to the polygon. I need some help, 'cause I'm new to java and don't know how to solve this problem. I managed to write the function to check if a point belongs to the line created. I would like to form groups of points using Steiner sets (spatstat::dilation). There are singletons which need to be removed, and I am thinking of using Stienen sets (spatstat::stienenSet) for that: for singletons Stienen > Steiner. I am writing some code to simulate a forest stand. I have simulated the positions of large and medium sized trees using Spatstats. The next step I want to do is simulate smaller trees. I have been trying to write some code that enables the smaller trees to be located further away from large and medium sized trees. I can simulate the correct number of smaller trees using a single number kappa for a Thomas clumping model in Spatstat, however this produces clumping close to larger/medium trees. I am struggling to simulate the correct number of smaller trees where the parent points are located in less dense parts of the forest stand. I have tried using the density function in spatstat on the large and medium sized trees. 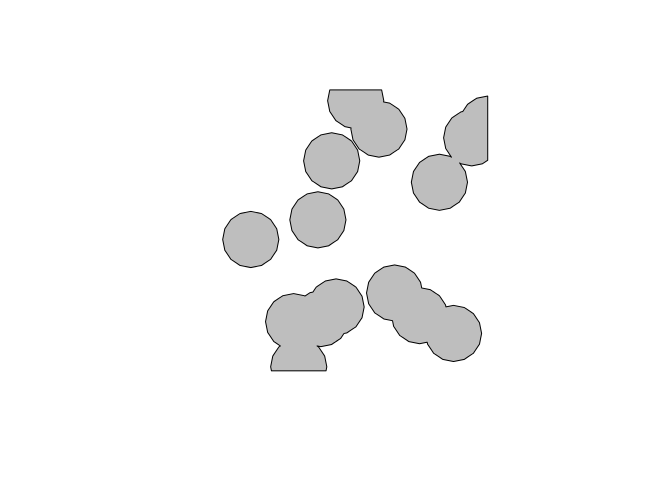 I then tried inverting the raster so that the areas with less trees have a higher pixel value, but I cant seem to find a way of changing this to a Kappa raster which will give me the correct number of smaller trees to be generated. I'm hoping to find a way of producing a kappa raster that simulates the correct number of points where the parent points are more likley to be produce in less dense areas of the stand. I am a little confused about how to implement one-tail Clark-Evans test in R. The significance level = 0.05 and HA = clustered distribution.